Effective January 23, 2017, the Bureau of Alcohol, Tobacco and Firearms (ATF) approved the purchase exemption from the Brady Handgun Violence Protection Act for Gold Card Permits and Enhanced Permits issued on or after 1/1/2017. Although our state asked for the purchase exemption for all Enhanced Permits that have been issued, ATF (federal government) only approved the ones issued on or after 1/1/2017. Beginning the first of this year the criteria for the background check changed to include the federal disqualifiers under 18 U.S.C. 922(g) or (n). This is outlined in South Dakota Codified Law 23-7-54. I would refer you to the Firearms Laws Handbook accessible from the left dashboard of this page. Because these requirements were not part of the FBI fingerprint background checks that were completed prior to 1/1/2017, ATF would not approve the purchase exemption for the Enhanced Permits issued prior to that date. Your card is currently recognized for concealed carry within South Dakota and 37 other states, including Nebraska and Minnesota. For a complete listing, refer to the left dashboard. Your card is already recognized for the purchase exemption. Your card is recognized for concealed carry within South Dakota and 37 other states, including Nebraska and Minnesota. For a complete listing, refer to the left dashboard. Legislation has been signed into law by the Governor, which allows you to update the issue date of your Enhanced Permit. If you wish to obtain the purchase exemption recognition, contact your county sheriff and request a second fingerprint background check. The fee is $43.25 paid to DCI. This fee is required by the FBI to complete the check. Upon approval, the sheriff will request the Secretary of State's office to reissue your Enhanced Permit with a current issue date. The expiration date will be changed to five years from the new issue date. There is no additional fee. A card with the new issue and expiration dates will be forwarded to you by our office. This card will then be recognized for the purchase exemption. You will be required to complete a qualifying handgun course taught by a South Dakota certified Instructor, along with the FBI fingerprint background check. The fee for the background check is $43.25 paid to DCI. Upon approval you will complete the application. The fee for the permit is $100. Your issued Enhanced Permit is recognized for concealed carry within South Dakota and 37 other states, including Nebraska and Minnesota. For a complete listing, refer to the left dashboard. Your issued permit is recognized for the purchase exemption. Contact your county sheriff to have your fingerprints taken. The fee is $43.25 paid to DCI. Upon approval you will complete the application. The fee for the permit is $70. There is no training requirement. 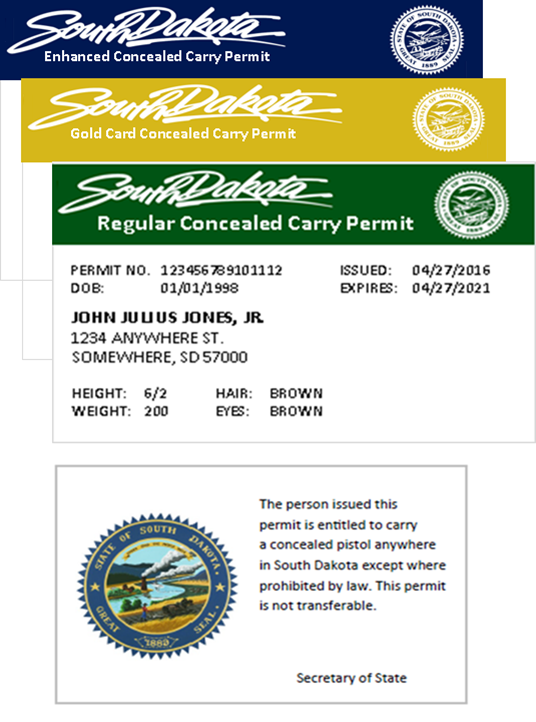 Your issued Gold Card Permit is recognized for concealed carry within South Dakota and 32 other states. The Gold Card is not recognized by Minnesota, Nebraska, Nevada or South Carolina. For a complete listing, refer to the left dashboard. For the current list of Enhanced Concealed Pistol Use of Force Instructors, click here. An individual who wishes to carry a concealed pistol on or about his person or in a vehicle must obtain a Permit to Carry a Concealed Pistol (SDCL 22-14-9). A person does not need a permit to own a pistol, keep it in his home, business, or property, or visibly carry it (SDCL 22-14-11). Carrying a concealed pistol without a permit is a class 1 misdemeanor punishable by one year imprisonment in a county jail or one thousand dollars, fine, or both (SDCL 22-14-9). A new or renewed Permit to Carry a Concealed Pistol may be obtained from the sheriff of the county which the applicant is a resident (SDCL 23-7-7). Three types of permits are available in South Dakota - a regular permit, a gold card permit and an enhanced permit. All three permits are valid for five years. The enhanced permit is only valid when is it carried with a government issued form of identification that includes a picture of the permit holder (SDCL 23-7-8.2, SDCL 23-7-55). The fee for the regular permit is $10.00 (SDCL 23-7-8.2). The fee for the gold card permit is $70 (SDCL 23-7-60). The fee for the enhanced permit is $100 (SDCL 23-7-53). The holder of the enhanced permit may renew the permit through the sheriff of the county where the holder resides for a period beginning ninety days before the permit expires and ending thirty days after expiration of the permit, if the holder pays the fifty dollar renewal fee and passes a National Instant Criminal Background Check. If the holder of the enhanced permit to carry a concealed pistol does not renew the permit within thirty days of expiration of the permit, the holder must reapply for an enhanced permit to carry a concealed pistol pursuant to SDCL 23-7-53 (SDCL 23-7-56). The holder of a gold card permit may renew the permit within 90 days of expiration (SDCL 23-7-62), as well as the holder of a regular permit who may renew 90 days prior to expiration (23-7-8.11). As per SDCL 23-7-8.13, individuals who have a permit issued in accordance with chapter 23-7 have a sixty day grace period to renew the permit. During the grace period the permit holder may continue to carry a concealed pistol and is not in violation of SDCL 22-14-9; however, law enforcement may issue a warning ticket in such situations to provide notification to the permit holder of the expired status. This grace period does not apply to any permit holder who commits a crime that would make it unlawful for the permit holder to possess a gun, or a permit holder who attempted to renew the holder's permit, but was denied (23-7-8.14). In addition to the above requirements, the enhanced permit also requires the following. The gold card permit requires the FBI fingerprint background check, but not the handgun course. Proof that the applicant has successfully completed a qualifying handgun course as defined in SDCL23-7-58 within the preceding twelve months or proof that the applicant is a current or former South Dakota law enforcement officer. The sheriff shall forward the copy of the applicant's fingerprints, the applicant's authorization for processing a fingerprint background check, and the payment for the fingerprint background check to the Division of Criminal Investigation for processing (SDCL 23-7-53). The applicant for a regular or enhanced permit must complete a form called an Application for a Temporary Permit to Carry a Concealed Pistol. The information required for the permit includes: the applicant's complete name, address, occupation, place and date of birth, physical description, a statement that the applicant has never pled guilty to, nolo contendere to, or been convicted of a felony or crime of violence, a sworn statement that the information on the application is true and correct, and the applicant's signature (SDCL 23-7-8). Providing false information or false evidence of identity in applying for a permit to carry a concealed pistol is a Class 6 felony punishable by two years imprisonment in the state penitentiary or a fine of two thousand dollars, or both. The sheriff will issue a regular temporary permit within five days from the date of application (SDCL 23-7-7.1). Because of the fingerprint background investigation for an enhanced permit, the issuance of the enhanced temporary permit may take longer. Within seven days after the regular or enhanced temporary permit has been issued, the sheriff shall send a copy of the application to the secretary of state who issues the official permit within 30 days of the issuance of the temporary permit (SDCL 23-7-8). Live fire training including the firing of at least ninety-eight rounds of ammunition by the student (SDCL 23-7-58). The Division of Criminal Investigation shall offer at least one course focused on the use of force, including applicable state laws, per year, open to National Rifle Association certified instructors. The Division of Criminal Investigation shall develop the use of force course and may promulgate rules pursuant to chapter 1-26 to establish the course standards for the issuance of a certificate of completion, establish a fee for the course not to exceed one hundred fifty dollars, and to implement the course (SDCL 23-7-59). For specific information regarding the training instructors or classes, please contact the Division of Criminal Investigation by clicking here or calling (605) 773-3331. Attorney general's explanation of the law on carrying firearms in vehicles. Those considering carrying a firearm while riding a motorcycle or off-road vehicle should review SDCL 32-20-6.6. Any active duty military personnel or the spouse of a person who is active duty military with South Dakota as their home of record is considered to have met the provisions of SDCL 23-7-7.5 (SDCL 23-7-7.5). For military personnel that possess a regular concealed carry permit that expires while the holder is deployed outside of the holder's state of residence, the holder may complete the following application form (click here) and have their unit commander or commanding officer attest to the identity of the holder. The application form and required accompanying documents are then mailed to the sheriff of the county of the holder's residence for the background. If approved, the temporary permit will be forwarded to the military member (SDCL 23-7-8.12). The permit is valid throughout South Dakota except in any licensed on-sale malt beverage or alcoholic beverage establishment that derives over one-half of its total income from the sale of malt or alcoholic beverages (SDCL 23-7-8.1); any county courthouse as defined in SDCL 22-14-22; or any elementary or secondary schools (SDCL 13-32-7). The permit is not transferable from one person to another (SDCL 23-7-8.3). According to SDCL 32-20-6.6, no person, other than a law enforcement officer or conservation officer, or any person on the person's own land or land leased by the person, may operate or ride on any motorcycle or off-road vehicle with any firearm in the person's possession unless the firearm is completely unloaded and within a carrying case which encloses the entire firearm. However, this section does not apply to any person who is carrying a pistol and possesses a permit to carry a concealed pistol issued pursuant to chapter 23-7. This section does not apply to any person who holds a permit issued pursuant to SDCL 41-8-37 while engaged in hunting from an off-road vehicle in accordance with the provisions of the permit. This section shall be enforced by all law enforcement officers including conservation officers. A violation of this section is a Class 2 misdemeanor. The Law Enforcement Officers Safety Act (LEOSA) of 2004 amended the Federal criminal code to authorize qualified law enforcement officers or qualified retired law enforcement officers carrying the photographic identification issued by their governmental agency, notwithstanding any other provision of the law of any State or political subdivision thereof, to carry a concealed firearm. The federal law provides that such authorization shall not supersede State laws that: (1) permit private entities to prohibit the possession of concealed firearms on their property; or (2) prohibit the possession of firearms on State or local government property. The law also excludes from the definition of "firearm" any machine gun, firearm silencer, or destructive device. Click here to view the Enrolled Act. The LEOSA was amended in 2010 to extend the coverage to include law enforcement officers of Amtrak Police, Federal Reserve Police and law enforcement officers of the executive branch of the Federal Government, along with military law enforcement personnel. The aggregate years for retired officers was reduced from fifteen to ten. Click here to view the 2010 amendment. The LEOSA was further amended in 2013 to clarify the definition of "qualified active" and "qualified retired" law enforcement officer, along with the term "police officer", expanding the powers of arrest requirement definition to include those who have or had the authority to "apprehend" suspects under the Uniform Code of Military Justice. Click here to view the 2013 amendment. As part of the Credit Card Act of 2009, an amendment to the Act prevents the Secretary of Interior from enforcing any regulation that would prohibit an individual from possessing a firearm in any unit of the National Park System or the National Wildlife Refuge System. This amendment overturned the prior policy prohibiting firearms from being carried in national parks. The Act was signed into law on May 22, 2009, and went into effect February 22, 2010. This Act does not change the requirement that individuals carrying firearms within a national park must abide by all firearms laws of the state within which the national park resides.